Step into a world of ice with this day trip to the Arctic Snow Hotel from Rovaniemi. 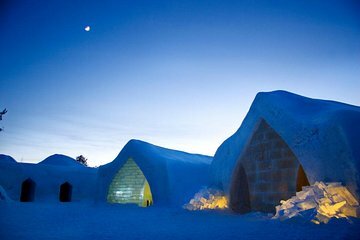 With round-trip transport and even use of winter clothes included, the excursion has everything you need to visit the famous Finnish ice hotel with ease. Inside, you’ll discover the hotel’s snow rooms complete with furniture made from ice, and quirky rooms such as the ice sauna. If you want to book a meal there at your own expense, simply organize it with the local supplier before you travel.